The Chancellor of the Exchequer, Philip Hammond MP, visited Ulster University’s Magee campus during a one-day visit to Northern Ireland. During his visit on 25 July 2018, the Chancellor met with the Vice-Chancellor and other senior staff to learn about the work of the University before taking a tour of the Intelligent Systems Research Centre. 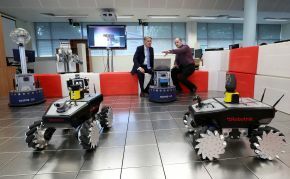 He visited the robotics lab and the Brain Computer Interface lab to hear about how the research being undertaken is having a positive impact on peoples’ lives and the wider economy. The Chancellor also took the opportunity to meet with senior stakeholders from across Derry~Londonderry to discuss the proposed City Deal for the region, in which Ulster University will play an integral role. I welcome the Chancellor’s announcement today that the UK government is inviting local partners to submit proposals for a Derry–Londonderry City Deal. I look forward to working with the local council and others to bring forward ambitious proposals for the government to consider. Today the Chancellor has also invited a city deal bid for the Derry-Londonderry City Region. This will give local councils, universities and businesses the chance to submit plans to government on their priorities for driving forward economic growth and boosting productivity for the benefit of the Derry-Londonderry city region and the whole of Northern Ireland. "Northern Ireland is leading the way within the UK in productivity growth. I want to support this progress by inviting a bid for a Derry-Londonderry City Deal, an opportunity for the region to continue to drive forward economic growth and build an economy that works for everyone." "I am delighted with today’s announcement, which is a positive step in progressing a City Deal for Derry-Londonderry. It is a testament to the many local partners who have worked tirelessly for progress to be made.